Around 543 BC Vijaya & company landed on Sri Lanka. A minister of Vijaya, named Anuradha, founded the Anuradha village. At a later date (before 250 BC), King Pandukabaya established the royal capitol city of Anuradhapura. Except for few intermittent periods, Anuradhapura remained the royal capitol from king Pandukabaya's regime until the chola invasion in 993 AC. On many occasions the prosperous royal city's temples & palaces were luted and burned down by invaders. 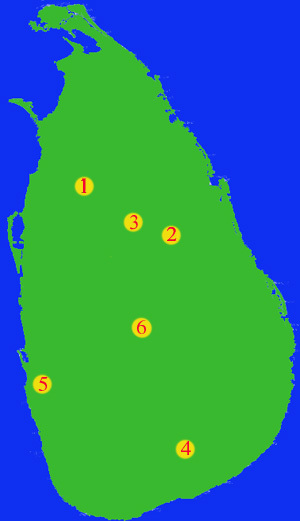 In 993 AC, the invading Choals burned the city of Anuradhapura and enforced their authority over the city of Polonnaruwa. They governed for 73 years. The Sinhala kingdom retreated to Ruhuna. The nation was liberated from the invaders by king Vijayabahu I (1055-1110 AC). After his victory, the royal capitol was re-established in Pollonnaruwa. Unitl the Kalinga Maaga invasion in 1214 AC, Polonnaruwa was the royal capitol of 11 kings & queens. For five centuries after that, the city was abandoned to the wilderness.